The Grivel Air Tech Crampon is a lightweight versatile 12 point crampon. It's available in three different bindings: New-Classic, New-Matic (Pictured above) and Cramp-O-Matic. The 12 points (or the 6 pairs of points) feature distinctly different shapes and angulation to provide traction on a wide variety of terrain types. The front points are relatively standard for mountaineering crampons (horizontal as opposed to forged vertical points with teeth), the secondary points sit relatively far back facing downwards, with the third short pair set wide apart. The fourth pair of points (last on the front section of the crampon) feature a double angulation designed to make descents and traverses easier. This rather complex combination of point arrangement does bring major advantages for the Grivel Air Tech Crampon over more conventional layouts. An additional set of points and double angulation fourth points on the front section makes them feel far more stable than an equivalent 10 point crampon, e.g. Grivel G10. Concomitantly the shorter points and less aggressive secondary points help to reduce the feeling of walking on stilts and lessen the likelihood of tripping when on rocky terrain. However, the less aggressive secondary points do compromise stability when moving on to steeper terrain. 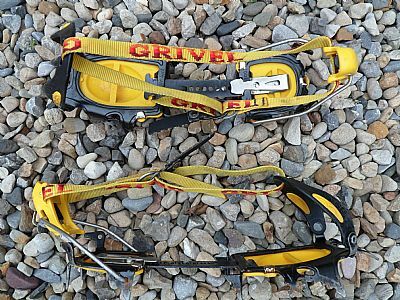 This is particularly noticeable when front pointing, where the secondary points rarely come in to play on the Air Tech Crampons – in contrast to something like a Grivel G12 where the secondary points are more aggressive and forward facing giving effectively 4 points in contact (2 front and 2 secondary points) on each foot. Lightweight (~110g saving over Grivel G12 and ~32g saving over Grivel G10). Point arrangement on front section gives good stability on many different terrain types. Shorter and less aggressive points decrease likelihood of tripping and make it easier to walk on rocky terrain. Easy to adjust sizing and binding system (even with gloves on). Compress down very small without accordions on (this does compromise safety in wet-snow conditions according to Grivel). Short downward facing non-aggressive secondary points preclude the Grivel Air Tech Crampons from being used on steep / front pointing terrain. Shorter points provide less traction in slushy snow conditions. The Grivel Air Tech Crampons are a lightweight extremely versatile crampon, providing better traction in a variety of different terrains than a G10, however the secondary points are likely to be a limiting factor when it comes to steeper terrain.